• The exhaust gas temperature sensor is installed to the front and rear of the DPF to detect the temperature in these positions. The engine ECU controls the exhaust temperature for PM combustion based on the signals from this sensor. The sensor element is a thermistor. • The differential pressure sensor detects the difference in pressure at the front and rear of the DPF, and outputs a signal to the engine ECU. The sensor portion is a semiconductor type pressure sensor that utilizes the piezoelectric effect through a silicon element, and amplifies and outputs the voltage with its IC circuit. When PM is collected and accumulated in the DPF, the filter clogs and the difference in pressure at the front and rear of the DPF increases. Therefore, based on the signals from this sensor, the engine ECU judges whether or not to subject PM to combustion processing. By optimizing the injection pattern and controlling the exhaust gas temperature based on the exhaust gas temperature and the difference in pressure at the front and rear of the DPF, PM is collected, oxidized, and self-combusted. 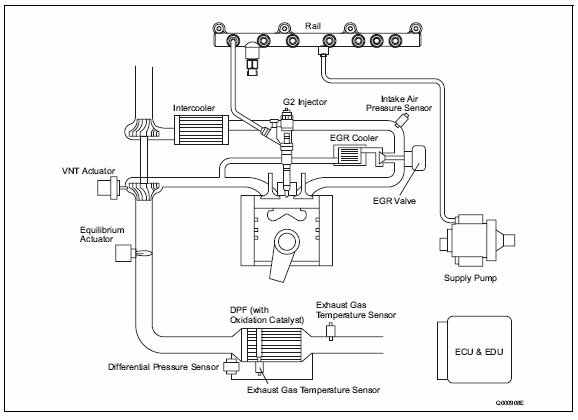 When the exhaust temperature is low, adding after-injection after the main injection raises the exhaust gas temperature to approximately 250?C and promotes oxidation of the PM. When the PM is collected and accumulated, the post-injection is added and HC is added to the catalyst to raise the catalyst temperature to 600?C, which is the self-combustion temperature for PM. This combusts the accumulated PM in a short time. The engine ECU controls the A, B, and C times and the injection times.